We started our week off with the return of our runaway bunny. Our neighbors spotted her and helped us chase her back into the fence so we could catch her. Lydia was a happy little girl. The kids wanted to see two of the new blockbusters out this week. Well with all the jobs and sports schedules, school time is at a premium. So after they were swimming Sunday (and had a picnic with the family), I made them all do math. The boys are starting pre-Algebra this week. Lydia has been continuing using Unlock Algebra (check out my review from last week), and Caty is working on her Math review starting with Life of Fred. She's loving this. I just ordered the next three books. The weather was warm, but nice, so the girls, Joe and I went for a walk. The girls are supposed to be working on leaf collections for Science Club and we are way behind. Exploring a little area in our town I had never showed them before. Monday brought work for the boys at the library. But first Lydia made lunch, soft tacos (cooking project). When the boys and I got home from the library we quickly started dinner. Brayden make baked fries (no one liked them). And he made BBQ meatball subs. Those were a hit. Then the girls and I rushed back to Napoleon for swim practice. The triathlon is getting closer and closer. This was a real workout for the girls. 1 lap in this pool is 50 m. Not what they are used to. So after swimming 400 m.... they were exhausted. I decided with the fact we are so busy that instead of starting World History as I planned, the girls and Brayden would review US History with movies and various activities this summer. We will be working on a timeline as they watch these videos. We'll start World History back up in September when all jobs are finished for the season (at least most of them...Lydia will still be working but only 1 day a week). This week we covered Columbus, Jamestown and the Pilgrims. Caty enjoyed watching the Charlie Brown America about the Pilgrims. We also refreshed ourselves about the Lost Colony, John Rolfe, Squanto, John Smith and Pocahontas. On Tuesday, Joey had to work at Core. Lydia had work at the library. It was a balancing act for me all day. But we managed to get all of their work done that I had down for us. We have discovered that Joey cannot have tomato sauce (like spaghetti sauce), it causes him major acid reflux. So I will be developing a creamy lasagna recipe for him. I just never made it because of his dairy allergy. Ugh...now he can have dairy, but not tomatoes. Poor kid has no idea why his body does this. I can barely understand when my own body attacks itself, so it's really hard for him. Tuesday was the only day this week where we really had a bit of downtime, or so I thought. I wanted to get the chicken coop fixed and the storage shed cleaned out. Guess what didn't happen...lol. But the kids got to go and see the new Transformers movie the day before the official release. They were super excited, well Caty wasn't. I really wanted to see it, but she didn't. So I will wait patiently for the release and we spent the evening together getting to know her new bunny. We were struggling with her and the size of her rabbit. She was actually afraid of it. So she and I went shopping and found a new bunny. Lydia is working on walking Snowball. She seems to be handling the harness well. Lydia worked on her miniature garden. In Science Club this week we studied how you can tell a tree by leaf shape and looked at the internal structure of leaves. They built leaf models. This is the source I used. They looked at leaf and stem slides under the microscope also. There was also some information on why trees have rings. The garden was overrun with weeds. So Caty, Brayden and I worked on cleaning it up. Wednesday both girls had golf. They won't get to go next week because of camps. They both LOVED it. On Wednesday night, Brayden was excited to attend Cook Night with our local Special needs Support Group. They were able to sit and socialize with a kid they knew from Special Olympics. They both had fun, though Joey won't admit it. This is a new thing for Brayden wanting to go and socialize at outside events. So we are trying to fit in things that Brayden wants to do, and what he asks about. When we got home, we saw quite a fire down the road. A gas tanker overturned. The flames were higher than the trees at one point. I couldn't get my camera on my phone to work. The smoke had actually cleared up quite a bit. As we were traveling home, we thought it was field fire. I could see the smoke about 10 miles away. I started seeing flames about 5 miles away. Then when we got home we found out what it was. It was scary looking. We did find out that the driver got out ok. We heard there were 4 fire departments on the scene at one point. Lydia is trying hard to see if Snowball will walk with her on a leash. She had read that Beatrix Potter used to walk her rabbit. Snowball isn't having it so far. Their cousin spent the night and Caty made an emoji cake. Caty LOVES anything emoji right now. Friday I spent most of the day making cereal treats for our first flea market that weekend. Every time I thought I was ahead, I was behind again. Watch for our adventures at the flea market next week. Linking up with other homeschool moms at Weird, Unsocialized Homeschoolers. 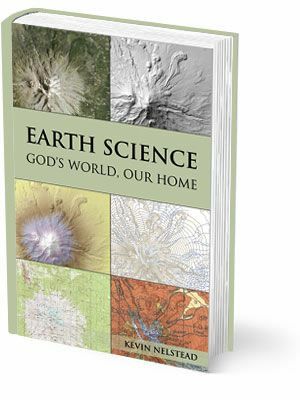 We have been reviewing a great middle school science publication from Novare Science & Math, Earth Science: God's World, Our Home, written by Kevin Nelstead. Novare Science & Math has successfully brought a Christian view into a science textbook. They have done this, not just by throwing in a few scriptures, but including God in the text since they realize he is the creator of the world. Every aspect of this curriculum is fully backed scientific resources, present Earth Science topics to your student in the most logical way possible. In fact the author, Kevin Nelstead has a B.A. in Earth Science and a M.S. in Geology. He has worked as a Senior Cartographer, Geospatial Analyst, and a Natural Resources Specialist for the United States government. I'd say he's pretty qualified, to write this textbook. Yet his book was still analyzed by other specialists in the science field to verify accuracy. Novare Science & Math strives for your student to develop the mastery level of science. They do not want the student to do the typical, study for a few days so you can pass the test and then forget it as soon as you are done with the test. They also incorporate math into their science, since they feel that these two subjects do go hand-in-hand. The Earth Science: God's World, Our Home has been written for late middle school level, suggested around eighth grade. It is packed full of information, and way more than I learned in science in eighth grade. Each chapter starts out with an explanation of what information is being presented. There is also a list of Objectives that your student should have learned during their reading and completing the exercises at the end of each sub-section. There is also a list of vocabulary terms that will be presented throughout the reading. I really liked that each chapter is broken down into smaller sections. This actually made it easier for Joey to work independently with this book. He did not feel overwhelmed with each smaller section as he is reading. At the end of each section there is also a Learning Check of around 3 to 5 questions to review what he just read. The illustrations in this book are amazing. I was wondering, because the size of this textbook is not as large as most of our science textbooks. I figured something probably had to go to achieve this smaller size. But the illustrations are great, and are strategically placed throughout each chapter to provide excellent learning experiences for those visual learners using Earth Science: God's World, Our Home program. We also had the opportunity to review the Earth Science: God's World, Our Home Resource CD ($50.00). It includes quizzes, experiments and even a lesson plan schedule to make your planning easier. To make your life even easier, there are answer keys so that you do not need to read every chapter your child is studying if they are using this program more independently. Also included on the Resource CD are extra images and Weekly Review Guides to print out for your students. It's basically their weekly to-do list for what they need to be completing each week. Gives them reminders as to what they need to finish in order to get the most from this Earth Science curriculum. Novare Science & Math is really striving to build a love of science in children, who may have in the past had poor experiences with just getting answers wrong. Students forget the majority of what they are learning, and it really just causes a completely frustrating experience. By removing the pressures of forcing to them learn a bunch of facts in a short amount of time, students can feel less pressure to master the material they are reading. That was the goal of this series, and I think they did a great job on this text. Joey has been enjoying the text so far, and when I asked if he was struggling in any way, he said no. He told me that he wants to complete the book, and that he is enjoying it. There have been a few questions he has struggled with, those mainly being the math questions that are incorporated in certain sections. But that is only because Joey is struggling in math, and is not at grade level in this area. He has been successful with this material, and I am looking at starting him on the Introductory Physics textbook when he finishes Earth Science: God's World, Our Home. So depending on the reason for the question, I either sit down and do those questions with him or just have him skip over them. He's still learning the material. For a child who is delayed several grades, he has been able to handle using Novare Science & Math - Earth Science: God's World, Our Home very well. The printable quizzes are also very easy for him to use. I use them different than most, and allow him to use his textbook the first time he completes them. Then we review the material together. We recently had the opportunity to review the Gr 8 Lightning Lit Set from Hewitt Homeschooling. This Literature & Composition series helps to prepare your student for their upcoming high school writing career. 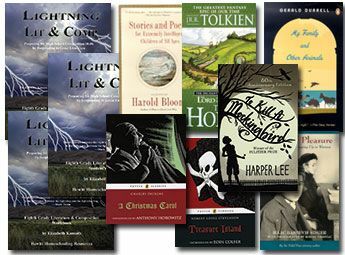 Gr 8 Lightning Lit Set takes classic literature titles such as Treasure Island, The Hobbit and even Charles Dickens and not only reinforces comprehension skills through the use of questions, but also incorporates the same literature into writing exercises. Topics that involve poetry, setting, the narrator, recognizing conflict, and genre all are introduced throughout the 36-week curriculum. Included in the package we received was the Lightning Lit & Comp Teacher’s Guide, Student Guide, Student Workbook, and Stories & Poems for Intelligent Children. You can purchase the Gr 8 Lightning Lit package that has all the books, as well as the chapter books needed to complete the program ($143.95). The package was a little overwhelming to open since I have never taught this level yet. It was new for us since the boys are delayed in areas such as literature and writing. Just looking over the first few pages in the Teacher’s Guide though had my confidence built back very quickly. Everything is completely laid out for you in the How to Use Lightning Literature & Composition for Grade 8 section. The Student’s Guide lays out suggestions for your student to make the best progress that they can while using Gr 8 Lighting Lit. It really serves to be like the “textbook” for this program. This is where your student will read about discerning the Author’s purpose for writing a story, or how to read the clues in a story, how to take notes, read the vocabulary list for their assigned reading, and even go through their comprehension questions. At the beginning of each chapter in the Gr 8 Lightning Lit Student’s Guide there is a reminder what pages each chapter corresponds with in the Teacher’s Guide and also the Student workbook. The Gr 8 Lightning Lit Workbook takes all the information from the Student’s Guide and provides practice for your student. They’ll work on identifying Fact and Opinion, proofreading skills, analyzing settings, identifying bias, and how to re-write source material. Not all the pages are just regular writing, there are fun word searches and crossword puzzles mixed throughout the pages. Joey is our kiddo that used the Gr 8 Lightning Lit Set. He is high school level, but delayed in comprehension and writing areas. He really needs to finish up some literature courses for transcript. So I was anxious to see how he would do with this series. After looking at the suggested schedule in the front of the Teacher’s Guide, I knew he would feel overwhelmed. Since he has some time over the summer and he’s working two days a week, I decided to take a slower pace with this program. I have been splitting up the reading assignments and assigned workbook pages. I have found a slower pace has worked out wonderful. If you have a student who is special needs and struggling in areas of literature and comprehension, Gr 8 Lightning Lit Set has been great for us. The breakdown in each chapter of the topics is well-written and easy to understand. As we read through each topic, the examples of the material are directly in his assigned literature reading. Instead of just reading a definition, he’s seeing it used in action. Then he can actually practice this type of writing through his assignment in his workbook. I Love the fact that I can slow down and adapt to his comprehension level and keep him from feeling overwhelmed. Even the practice writing assignments do not seem to be overwhelming for him to tackle. The directions are clear and understandable. The pages provided for him to complete his writing on (usually two pages of lines) help him see the end sooner. So he’s not as anxious to be working on writing assignments. This is definitely a Joey issue, he’s hates seeing pages of extra lines to write. He really likes concise instructions and being told what to write about. But there’s just enough free-thinking thrown in that he doesn’t always realize he’s being creative. I am super happy with the Gr 8 Lightning Lit Set. This is the first literature arts curriculum we have used from Hewitt Homeschooling. I truly do not using literature arts series most times. The grammar is always worksheet style and the kids struggle. Face it, we are all bored to death doing it that way. I have really liked this series, and I am already looking at getting the Gr 7 Lit Set for Lydia and the Gr 3 Lit Set for Caty to start this fall. The ease of use has been wonderful for me. You can purchase the Student Workbook, Student's Guide and Teacher's Guide separately, if you already have the required books. I am grateful for this, since on the other levels I'm looking at for the girls, we already own most of the books. Several members of the Homeschool Review Crew were given the opportunity to try out the other Lightning Lit Grade levels. They also tried other wonderful products from Hewitt Homeschooling, including the High School literature levels that include history. Click the link below to get the chance to read how they used these products in their homes and what they thought of them.